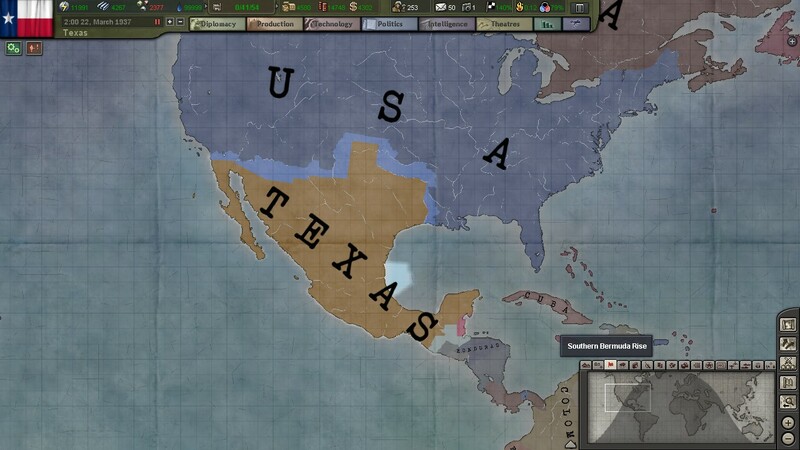 This mod started out with the purpose of Texas as a playable nation. With 0.1, that was completed. We have no intention to stop with that! No longer will civilians mindlessly toil in factories as the country quite literally burns around them! Strategic Bomber Campaigns will have the ability to break the back of a nation, in the style of the great Seversky. With them comes an increased need for Air Defence, amounting to the truly epic air battles of the Second World War. No more light armor plodding along at speeds equal to an offensive of the great war! Mobile units will be exactly that. With great power comes great responsibility, however. Be far more mindful of the terrain, an armored offensive will grind to a halt if it has to scale a mountain range. In addition, fuel will become the crucial issue that faced oh so many commanders of the real world. An army, after all, marches on its stomach. Even into the twentieth century, there were skirmishes on the Texas-Mexico border, and our alternate history, dear reader, has not changed this. 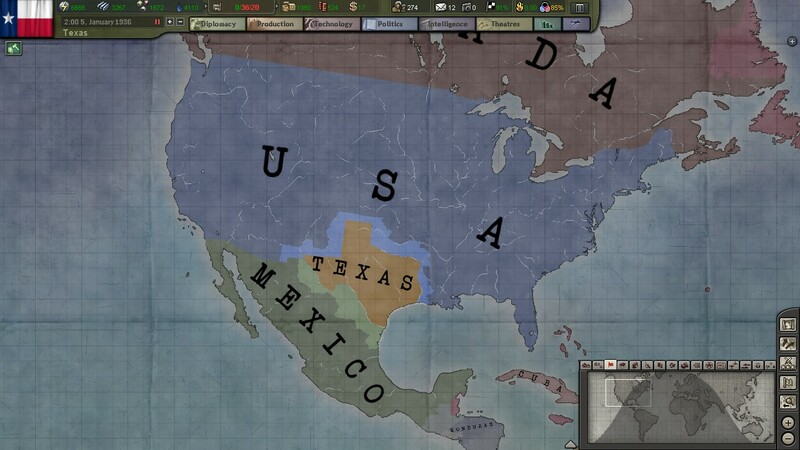 New events and decisions that will help you determine the fate of North America. Withdraw from the front, to avoid further confrontation with the once mighty Mexican Army? Or exploit the situation to further your goals? Don't expect a cake walk, the Mexicans will be receiving upgrades to match their historical counterpart too. Force cut off in Germany, with hopes fading fast? If you're allied with the United States, you may be able to call them to your aid. Much like how the 442nd fought through Axis lines to save the 1st Battalion, 36th Infantry. Yes, that's right. A battlecruiser named after a man who helped greatly to get this on the road, and more. Take heart, lads! For victory is with you this day! Bring Texas to her ultimate glory! Fight shoulder to shoulder with the Americans in the Pacific, fight alongside British steel in Africa. Fight with the Axis powers, to gain land and riches! 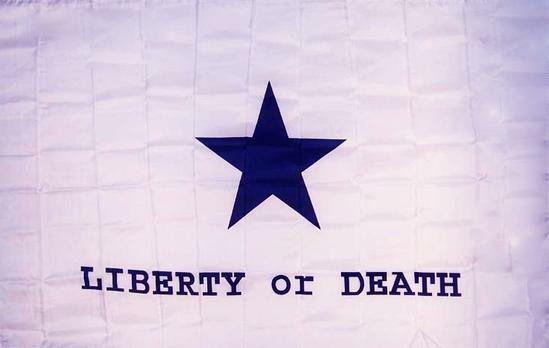 The first alpha (0.1) of Texas Rising has been released! As a Texan i am very excited to play this! Great job and keep up the good work! Just a quick update, hit a major snag on the second attempt to make this playable. Hopefully should be able to get the first version out in a few days still. Early Access release 0.1, the mod is playable, albeit lacking in features! It will be interesting to test it out!